The end of the nineteenth century brought about a dynamic transition for Longmeadow, transforming it from a quiet, rural village into a suburban community. A map published in 1894 shows just over one hundred homes in all of Longmeadow, with the vast majority being clustered around the Green on Longmeadow Street. Most of the rest are liberally peppered along the north and south portions of the street, with only a handful of farms located in the outlying regions east of Route 5. Only thirty years later, in 1924, the Board of Assessors listed 842 dwellings. What caused this massive building boom? In the 1890's three major events set the stage for rapid development. Summer 1908- Photo shows construction of elevated portion of trolley tracks. In 1896 tracks for an extension of the Springfield Street Railway were laid along Longmeadow Street. This suddenly made Springfield easily accessible from Longmeadow, paving the way for urban professionals to bring their families to the "country," yet easily commute to their places of employment in the city. In Western Massachusetts: A History 1636- 1925, it is noted that "Longmeadow has always been the home of retired, refined and well-to-do people of intellectual tastes and tendencies." 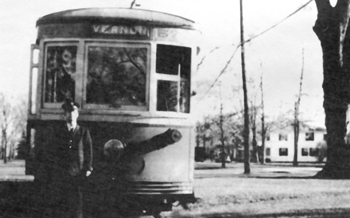 The streetcar created even more opportunity for gracious living in the new suburbs. Another contributing factor to the development of Longmeadow as a quiet suburb was the creation of Forest Park, just to the north of Longmeadow. The park was dedicated in 1890 when a portion of Longmeadow land was ceded to Springfield to supplement the sizable donation of land from the estate of Everett Barney and others. This 756-acre park, designed by the noted Olmsted Brothers firm, quickly became a green buffer between city and suburb, enhancing the quality of life for Longmeadow residents as well as for city dwellers. The third event of major significance occurred in 1893 when the western, rural part of Longmeadow requested an official separation from the eastern, more industrial part of town. The third of the population living in the western section of town paid more than half the municipal taxes. Socially, the west was composed of wealthier businessmen, farmers and professionals, while the eastern part of town, with its active quarries and small businesses, was populated by workers' families living in smaller homes. In 1894, when East Longmeadow became incorporated as a separate town, Longmeadow immediately appropriated $30,000 for a modern public water system. 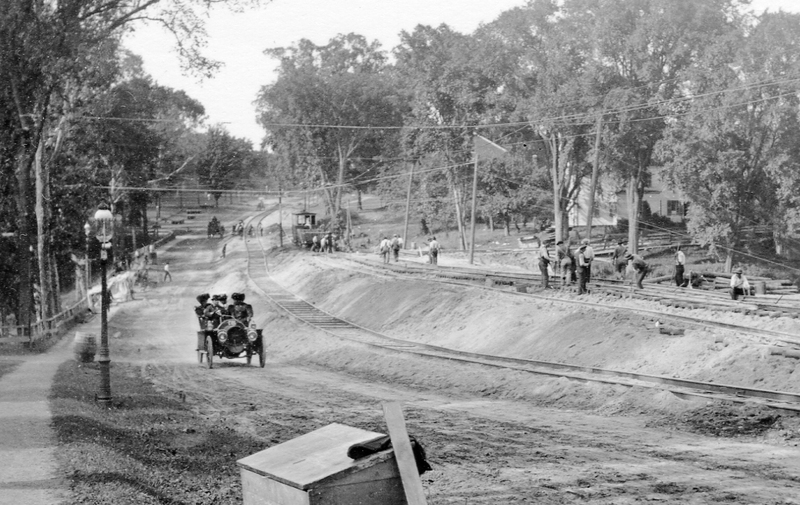 The reservoir, located in the present day Laurel Park, and updated water delivery and sewer systems, prepared the town for the denser, suburban development which soon followed. Ground was broken in 1898 for South Park Terrace, the first of many still extant suburban neighborhoods along the northern portion of Longmeadow Street. Built on 45 acres between the Springfield line and Converse Street, it was the first planned suburban development outside the city of Springfield. Advertised as "Springfield's most beautiful suburb" by its developers, J. William Cheney, Theodore Leete and Edward Murphy, it was promoted as a residential area that would "afford people of moderate means a wealth of health-giving qualities of pure air, pure water, dry soil and the perfect contentment of village life." Other residential developments soon followed. The early 1900's witnessed the building of "The Elms" along Warren Terrace and Elmwood Avenue, on land formerly part of the Alexander Field estate at 280 Longmeadow Street, the "Brookline" development along Westmoreland Avenue, and the "James H. Lewis Plan" laid out along Edgewood Avenue. The homes in these neighborhoods reflected the architectural tastes of the time, from late Queen Anne styling to Craftsman, Bungalow, Colonial Revival and Tudor Revival. Colonial Revival soon became the prevailing style, as, in the 1910's, Ellington Street was laid out followed in the 1920's by Farmington and Pleasantview Avenues. By 1920, Field Road had been laid out, and the rest of the lots along Converse Street, Warren Terrace and Edgewood Avenue were fully built up. The Depression did not slow the pace of construction as suburban development continued to boom. Meadowbrook Road and Englewood Road were carefully developed under new zoning codes and deed restrictions, perfecting the tradition of set minimum housing costs, required review and approval of building and landscape plans and prohibition of farm animals and above-ground wiring. Great care was given in developing new neighborhoods that would enhance, rather than detract from, the overall appearance of Longmeadow as a lovely, residential suburb. As a testament to this planned development, the Massachusetts Historical Commission, on September 8, 1993, voted eligible for listing on the National Register of Historic Places, the length of Longmeadow Street from the Springfield city line south to Cooley Drive and Westmoreland Avenue, based on the area's historic significance as a "streetcar suburb."